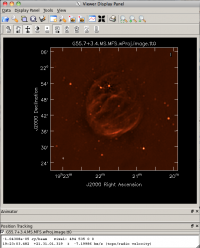 This CASA Guide describes the imaging of the supernova remnant G55.7+3.4.. 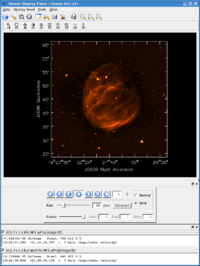 The data were taken on August 23, 2010, in the first D-configuration for which the new wide-band capabilities of the WIDAR correlator were available. The 8-hour-long observation includes all available 1 GHz of bandwidth in L-band, from 1-2 GHz in frequency. This will take a minute, but once it's complete, you will have a directory called G55.7+3.4_10s.ms which is the filled data, with online flags applied (which delete known bad data), with some uninteresting scans removed, and time-averaged to 10 seconds. (The data were taken in D-configuration [max baselines 1 km], so one can safely average to 3s or even 10s to reduce dataset size.) This is equivalent to what you would download from the archive if you requested time-averaging, scans 16~313, and online flag application. here; note that it is 170 GB in raw form. Averaging to 10 seconds and the removal of some scans which are not used in this tutorial reduces the size of the data set to around 14 GB; the addition of columns for model and corrected data (known as "scratch columns") returns it to 43 GB, which is the size of the MS which will be used here. Start CASA by typing casapy on the command line. If you have not used CASA before, some helpful tips are available on the Getting Started in CASA page. Note that throughout this tutorial, we will run tasks using the task(parameter=value) syntax. When called in this manner, all parameters not explicitly set will use their default values. Observer: Dr. Sanjay Sanjay Bhatnagar     Project: T.B.D. 0542+498=3C147, field ID 3: the flux and bandpass calibrator. CALIBRATE_BANDPASS indicates that these scans are to be used for bandpass calibration. Note that 3C147 is to be used for both flux and bandpass calibration. This shows that antennas ea01, ea18, and ea03 were on the extreme ends of the west, north, and east arms, respectively. 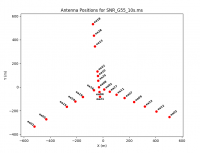 The antenna position diagram is particularly useful in determining if a co-located set of antennas is affected, which can help with flagging. 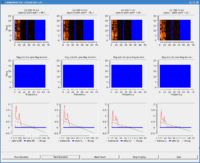 The coloraxis parameter indicates that a different color will be assigned to each spectral window, and the iteraxis parameter tells plotms to display a new plot for each scan. 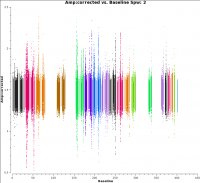 We have chosen only one antenna (ea24) and just the right and left circular polarizations (without the cross-hand terms) to reduce the amount of data in the selection, One can flip through these plots using the green arrows located at the bottom of the plotting gui: the double-left arrow will display the very first plot in the set, the single left arrow will go back one plot, and the right arrows have similar behavior for moving forward in the set. Flipping through the scans, it's clear that there is significant time- and frequency-variable RFI present in this observation. Since this is L-band data taken in the most compact EVLA configuration ("D"), this comes as no surprise. However, it also poses one of the greatest challenges for obtaining a good image. Found 11 points (11 unflagged) among 479232 in 0.04s. We can see that SPWs 1 and 4 are among the worst affected by RFI. At this point, feel free to play around a bit more with plotms; you might try experimenting with different axes for iteration (under the "Iter" left-hand tab), different data selection parameters (under "Data"), different axes ("Axes"), or different averaging techniques (under "Data"). Before we proceed with further processing, we should check the observation log to see if there were any issues noted during the run that need to be addressed. The observing log file is linked to the archive web page for this observation (at far right; under "logs etc."). Looking at the log, we can see that antenna ea07 may need a position correction, and antennas ea06, ea17, ea20, and ea26 did not have L-band receivers installed at the time and should be flagged. Correcting the position of an antenna is done with the task gencal. This is important, because the observed visibilities are a function of and . If an antenna's position is incorrect, then and will be calculated incorrectly, and there will be errors in any image derived from the data. Any corrections can be ascertained from the EVLA/VLA Baseline Corrections site. For future reference, be sure to read to the bottom of that document to see how to calculate the additive corrections. Fortunately, the current case is simple as there is only a single correction for antenna ea07. We will carry this table throughout the calibration to account for the revised antenna position for ea07. Note that the first thing flagdata does is create a backup flag file, in this case named "manualflag_1". This flag file contains a copy of the flags present in the MS prior to the requested flagging operation, and can be found inside the <MS_name>.flagversions directory, along with any other backed up flag files. Since these flag files take up a fair amount of space (in this particular case, 230 MB), we won't me making them every time we run flagdata -- the automatic flag backup can be turned off by setting flagbackup=False. However, it's good to keep a record of the names of the backup files and the associated processing step, in case you wish to restore a previous version of the flags. In this particular observation, there appears not to be any data affected by shadowing, as can be seen in the logger report. clipminmax=[0.0, 1E-10]: this is the clip range to be used. Since we cannot give it [0.0, 0.0], the second value is extremely low to pick up only zero-valued data. clipoutside=False: tells flagdata which data to flag; in this case; we wish to flag inside the specified data range. clipcolumn='DATA': the column on which to flag. clipexpr=['ABS RR','ABS LL','ABS RL','ABS LR']: flag any correlation which is zero-valued. Inspecting the logger output which is generated by flagdata shows that there is a very small quantity of zero-valued data present in this MS. Note that the archive will automatically flag shadowed antennas as well as zero-valued data, if you request that online flags are applied. Now, we move on to one of the most difficult parts of L-band, D-configuration data processing: excising the RFI. For the original reduction of this MS, flagging was done by hand and took several weeks. The resulting data are offered as an option for the imaging stage of this tutorial (because the care, by-hand flagging does yield a better image); however, it's not practical to undertake this endeavor for the present workshop. Therefore, we will demonstrate the use of the automatic RFI excision task, testautoflag, currently available in CASA. It should be noted that this task is under development, and we expect changes and improvements to be made at a rapid pace over the course of the next year or so. Prior to flagging any data which is affect by strong RFI, one should Hanning-smooth over channel to remove Gibbs ringing. This is done with the task hanningsmooth, which can either write a new, Hanning-smoothed MS or directly operate on the requested column of the input MS. To conserve space, we will request the latter. Note that if you wish to make your own "before" and "after" plots, you should make the first prior to running hanningsmooth, since you will be overwriting the non-Hanning-smoothed data in the process -- and this is not reversible. This task will take a few minutes to run. We can compare the Hanning-smoothed data with the raw data by plotting a subset of data to show the result of Hanning-smoothing (see plots to the left and right). As you can see, the smoothing has spread the single-channel RFI into three channels, but has also removed the effects of some of the worst RFI from a number of channels. Overall, this will improve our ability to flag RFI from the data and retain as much good data as possible. This will also take a few minutes to run, since it will be writing approximately 22 GB back to disk. Since there are likely to be gain variations over the course of the observation, we will run gaincal to solve for an initial set of antenna-based phases over a narrow range of channels. These will be used to create the bandpass solutions. While amplitude variations will have little effect on the bandpass solutions, it is important to solve for these phase variations with sufficient time resolution to prevent decorrelation when vector averaging the data in computing the bandpass solutions. 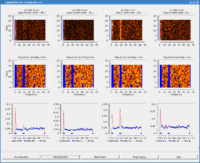 In order to choose a narrow range of channels for each spectral window which are relatively RFI-free over the course of the observation, we can look at the data with plotms. Note that it's important to only solve for phase using a narrow channel range, since an antenna-specific delay will cause the phase to vary with respect to frequency over the spectral window, perhaps by a substantial amount. yselfscale=True: sets the y-scaling to be for the currently displayed spectral window, since some spectral windows have much worse RFI and will skew the scale for others. caltable='G55.7+3.4_10s.initPh': this is the output calibration table that will be written. intent='CALIBRATE_PHASE*': this is the way we have chosen to select data. Alternatively, we could have used "field='J1925+2106'", since this is the only source with the CALIBRATE_PHASE* scan intent. Note the use of the wildcard character "*" at the end of the string; this accounts for the fact that all the intents end with ".UNSPECIFIED". We could just as well have used "*PHASE*". solint='int': we request a solution for each 10-second integration. spw='0:10~13,1;3;5~6:30~33,2:32~35,4:35~38,7:46~49': note the syntax of this selection: a ":" is used to separate the SPW from channel selection, ";" is used to separate within this selection, and "~" is used to indicate an inclusive range. refant='ea24': we have chosen ea24 as the reference antenna after inspecting the antenna position diagram (see above). It is relatively close to, but not directly in, the center of the array, which could be important in D-configuration, since you don't want the reference antenna to have a high probability of being shadowed by nearby antennas. minblperant=3: the minimum number of baselines which must be present to attempt a phase solution. minsnr=3.0: the minimum signal-to-noise a solution must have to be considered acceptable. Note that solutions which fail this test will cause these data to be flagged downstream of this calibration step. gaintable='G55.7+3.4_10s.pos': use the antenna position correction for ea07 that we created earlier. Note that a number of solutions do not pass the requirements of the minimum 3 baselines (generating the terminal message "Insufficient unflagged antennas to proceed with this solve.") or minimum signal-to-noise ratio (outputting "n of x solutions rejected due to SNR < 3 ..."). A particularly large number of solutions are rejected in SPW 4, where the RFI is most severe. Clearly, the phases are affected by RFI in some places, especially in SPW 4.
solint='inf', combine='scan': the solution interval of 'inf' will automatically break by scans; this requests that the solution intervals be combined over scans, so that we will get one solution per antenna. gaintable=['G55.7+3.4_10s.pos', 'G55.7+3.4_10s.initPh']: we will pre-apply both the corrected antenna position as well as the initial phase solutions. interp=[, 'nearest']: by default, gaincal will use linear interpolation for pre-applied calibration. However, we want the nearest phase solution to be used for a given time. Again, we can see that a number of solutions have been rejected by our choices of minblperant and minsnr. This operation will flag data for which correspond to flagged solutions, so applycal makes a backup version of the flags prior to operating on the data -- in this case, it's called "before_applycal_1". Note that running applycal might take a little while, likely around 10 minutes. Note that some of the worst RFI is no longer there; also note that the amplitude scale has changed, since the bandpass solutions include amplitude scaling. halfwin        =          1        #  Half-width of sliding window to use with 'usewindowstats' (1,2,3). Additional information on the algorithm used in this task ("TFCrop"), as well as some heuristics and more examples, can be found on this webpage. Following are a set of testautoflag commands which have been found to work reasonably well with these data. Please take some time to play with the parameters and the plotting capabilities. Since these runs set "datadisplay=True" and "writeflags=False", the flags are displayed but not actually written to the MS. This allows one to try different sets of parameters before actually applying the flags to the data. Some representative plots are also displayed. Each column displays an individual polarization product; since we're using all four, from left to right are RR, RL, LR, and LL. The first row shows the data with current flags applied, and the second includes the flags generated by testautoflag. The x-axis is channel number (the spectral window ID is displayed in the top title) and the y-axis of the first two rows is all integrations included in a time "chunk", set by the ntime parameter. These are the data considered by the testautoflag algorithm during its fitting and flagging process, and changes in ntime will have some (relatively small) affect on what data are flagged. 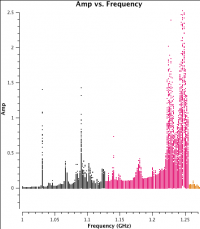 The third row displays a histogram of the spectrum over this chunk (in red), as well as the fit determined by testautoflag (in green), and the post-flagged data (blue points). 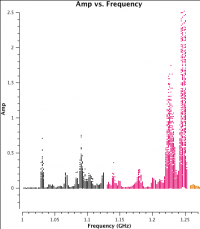 Each plot page displays data for a single baseline and time chunk. The buttons at the bottom allow one to step through baselines (backward as well as forward) as well as time; "Stop Display" will continue the flagging operation without the GUI, and "Quit" aborts the run. Looking at the plots for our data, we can see that testautoflag works quite well with narrow-band RFI but struggles with wide-band RFI or spectral windows where many channels have already been flagged. datacolumn='corrected': we wish to operate on the bandpass-corrected data, since we will be using the 'line' option for frequency fitting (which will fit a straight line rather than a bandpass-approximating polynomial). freqfit='line': since there is RFI present which is broad in frequency, using a polynomial (freqfit='poly') on the raw data will not work well here -- it will simply fit the RFI as if it were part of the bandpass. Therefore, we are using bandpass-corrected data and a line for the fitting process. timefit='poly': sets the time-domain portion of the fitting to use a polynomial (default is 'line'). Feel free to play with this parameter; your mileage may vary. maxnpieces=1: the TFCrop algorithm performs a robust fit to the data using up to 5 iterations, each of which uses a third-order polynomial for each "piece" of data. Once you are happy (or as much so as possible), run testautoflag with "writeflags=True" to write the flags to the data. Note that we are now flagging all sources, and the spectral windows have been grouped according to the "freqcutoff" parameter, which is the only parameter that has changed in this example. Of course, the amount of time one may spend investigating the data and trying different parameters could be vast. It's important to keep in mind that the reason we're using automatic flagging in the first place is to minimize the amount of time a human must spend worrying about RFI excision. Field:J1925+2106  Spw:1000.00MHz-1126.00MHz --> Flagged 78.29%. Field:G55.7+3.4  Spw:1000.00MHz-1126.00MHz --> Flagged 83.91%. Field:0542+498=3C147  Spw:1000.00MHz-1126.00MHz --> Flagged 51.10%. Field:J1925+2106  Spw:1128.00MHz-1254.00MHz --> Flagged 99.49%. Field:G55.7+3.4  Spw:1128.00MHz-1254.00MHz --> Flagged 99.48%. Field:0542+498=3C147  Spw:1128.00MHz-1254.00MHz --> Flagged 87.58%. Field:J1925+2106  Spw:1256.00MHz-1382.00MHz --> Flagged 58.28%. Field:G55.7+3.4  Spw:1256.00MHz-1382.00MHz --> Flagged 60.99%. Field:0542+498=3C147  Spw:1256.00MHz-1382.00MHz --> Flagged 49.12%. Field:J1925+2106  Spw:1384.00MHz-1510.00MHz --> Flagged 35.99%. Field:G55.7+3.4  Spw:1384.00MHz-1510.00MHz --> Flagged 37.49%. Field:0542+498=3C147  Spw:1384.00MHz-1510.00MHz --> Flagged 33.37%. Field:J1925+2106  Spw:1648.00MHz-1774.00MHz --> Flagged 45.38%. Field:G55.7+3.4  Spw:1648.00MHz-1774.00MHz --> Flagged 47.03%. Field:0542+498=3C147  Spw:1648.00MHz-1774.00MHz --> Flagged 37.64%. Field:J1925+2106  Spw:1776.00MHz-1902.00MHz --> Flagged 33.12%. Field:G55.7+3.4  Spw:1776.00MHz-1902.00MHz --> Flagged 34.13%. Field:0542+498=3C147  Spw:1776.00MHz-1902.00MHz --> Flagged 30.61%. Field:J1925+2106  Spw:1904.00MHz-2030.00MHz --> Flagged 61.48%. Field:G55.7+3.4  Spw:1904.00MHz-2030.00MHz --> Flagged 63.38%. Field:0542+498=3C147  Spw:1904.00MHz-2030.00MHz --> Flagged 63.76%. Now that the automatic RFI excision is complete, have a look at the data with plotms and evaluate the results. Note: since this is the same plotms command as we gave above, you might need to use Shift+Plot (or check "force reload") to see the data with the new flags applied. Another instructive way to view the data is by baseline and uv-distance. Note that we're plotting all baselines in these plots, rather than just baselines to ea24 as before. Clearly, there is still some residual RFI left here and there -- however, for the purposes of this tutorial, we will accept the current state of the flags and move on. Feel free to hunt and excise some more, if desired. Now that we are (mostly) happy with the RFI excision, we will move on to the calibration stage. Since we will be using 3C147 as the source of the absolute flux scale for this observation, we must first run setjy to set the appropriate model amplitudes for this source. If the flux calibrator is spatially resolved, it is necessary to include a model image as well. Although 3C147 is not resolved at L-band in D configuration, we include the model image here for completeness. scalebychan=True: scales the model flux density value for each channel. By default, only one value per spectral window is calculated. We will follow the same procedure outlined above for calculating the antenna bandpasses, except that this time, we will use the actual designated bandpass calibration source, 3C147. Although the phase calibration source has the advantage of having been observed throughout the run, it has an unknown spectrum which could introduce amplitude slopes to each spectral window. solint='inf', combine='scan': again, the solution interval of 'inf' will automatically break by scans; this requests that the solution intervals be combined over scans, so that we will get one solution per antenna. Don't let the apparently odd-looking phases for ea24 fool you -- check the scale! Remember, this is our reference antenna. solint='inf': we request one solution per scan. 1923+210   B1950  A 19h23m49.792400s  21d00'23.305000"
So we should be satisfied that our calibration up to this point is reasonable. To check that everything has truly proceeded as well as we would like, this is a good time to look at the calibrated data in plotms. A very useful way to check the goodness of calibration is to plot the corrected amplitude vs. corrected phase (which should look like a tight ball for a point source, and will have organized structure if the source is resolved), and corrected amplitude vs. baseline, which should be a flat line of points for a point source, and will reveal any lingering antenna-based problems. For a resolved source, it may be more instructive to plot corrected amplitude vs. uv-distance. Now that we are satisfied with the calibration, we will create a new MS which contains only the corrected data for G55.7+3.4 using the task split. This will substantially reduce the size of the MS, and will speed up the imaging process. We can also drop the polarization products since they have not been calibrated and will not be used for imaging. At this point, one may image either the resulting MS from the flagging and calibration steps above, or the MS that was flagged by hand and calibrated. The latter is available as "G55.7+3.4.byHandFlag.ms". (For internal, pre-workshop testers: the data can be found at /lustre/sbhatnag/Tests/ThursdayLectures/G55.7+3.4_10s_Calib.ms.) For this tutorial, we will use the MS that has been produced using testautoflag and the minimal amount of manual flagging described here, with the exception of the final clean step, where we will run identical commands on both sets of data and compare the results. The size of the primary beam is 45 arcmin divided by the observed frequency in GHz, or around 30 arcmin. Since the observation was taken in D-configuration, we can check the Observational Status Summary to find that the synthesized beam will be around 44 arcsec. We want to oversample the synthesized beam by a factor of around five, so we will use a cell size of 8 arcsec. Since this field contains bright point sources significantly outside the primary beam, we will create images that are 170 arcminutes on a side, or almost 6 x the size of the primary beam. This is ideal for showcasing both the problems inherent in such wide-band, wide-field imaging, as well as some of the solutions currently available in CASA to deal with these issues. So, for R = 1 degree, S(R) = 1 Jy, = 1 mJy − 100 Jy. Clearly, this will be a source of significant error. Since G55.7+3.4 is an extended source with many spatial scales, the most basic (yet still reasonable) imaging procedure is to use clean with multiple scales. As is suggested, we will use a set of scales (which are expressed in units of the requested pixel, or cell, size) which are representative of the scales that are present in the data, including a zero-scale for point sources. Note that interrupting clean by Ctrl+C may corrupt your visibilities -- you may be better off choosing to let clean finish. We are currently implementing a command that will nicely exit to prevent this from happening, but for the moment try to avoid Ctrl+C. imagename='G55.7+3.4.multiScale': the root filename used for the various clean outputs. These include the final image (<imagename>.image), the relative sky sensitivity over the field (<imagename>.flux), the point-spread function (also known as the dirty beam; <imagename>.psf), the clean components (<imagename>.model), and the residual image (<imagename>.residual). imsize=1280: the image size in number of pixels. Note that entering a single value results in a square image with sides of this value. multiscale=[0,6,10,30,60,120]: a set of scales on which to clean. Since these are in units of the pixel size, we are requesting scales of 0 (a point source), 48, 80, 240, 480, and 960 arcseconds. The larges scale, equal to 16 arcminutes, roughly corresponds to the size of G55.7+3.4. interactive=False: we will let clean use the entire field for placing model components. Alternatively, you could try using interactive=True, and create regions to constrain where components will be placed. However, this is a very complex field, and creating a region for every bit of diffuse emission as well as each point source can quickly become tedious. niter=1000: this controls the number of iterations clean will do in the minor cycle. weighting='briggs': use Briggs weighting with a robustness parameter of 0 (halfway between uniform and natural weighting). stokes='I': since we have not done any polarization calibration, we only create a total-intensity image. threshold='0.1mJy': threshold at which the cleaning process will halt; i.e. no clean components with a flux less than this value will be created. This is meant to avoid cleaning what is actually noise (and creating an image with an artificially low rms). It is advisable to set this equal to the expected rms, which can be estimated using the EVLA exposure calculator. However, in our case, this is a bit difficult to do, since we have lost a hard-to-estimate amount of bandwidth due to flagging, and there is also some residual RFI present. Therefore, we choose 0.1 mJy as a relatively conservative limit. This is the fastest of the imaging techniques described here (it will probably take less than ten minutes to complete), but it's easy to see that there are artifacts in the resulting image. For example, use the viewer to explore the point sources near the edge of the field. Some have prominent arcs, as well as spots in a six-pointed pattern surrounding them. Next we will explore some more advanced imaging techniques to mitigate these artifacts. The next clean algorithm we will employ is W-projection, which is a wide-field imaging technique that takes into account the non-coplanarity of the baselines as a function of distance from the phase center. 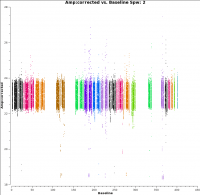 For more details on the motivation for this correction, as well as the algorithm itself, see "The Noncoplanar Baselines Effect in Radio Interferometry: The W-Projection Algorithm". wprojplanes=128: the number of W-projection planes to use for deconvolution; 128 is the minimum recommended number. This will take longer than the previous imaging round (likely around 15 minutes); however, the resulting image has noticeably fewer artifacts. In particular, compare the same outlier source in the W-projected image with the multi-scale-only image: note that the swept-back arcs have disappeared. There are still some obvious imaging artifacts remaining, though. Another consequence of simultaneously imaging the wide fractional bandwidths available with the EVLA is that the primary beam has substantial frequency-dependent variation over the observing band. If this is not accounted for, it will lead to imaging artifacts and compromise the achievable image rms. If sources which are being imaged have intrinsically flat spectra, this will not be a problem. However, most astronomical objects are not flat-spectrum sources, and without any estimation of the intrinsic spectral properties, the fact that the primary beam is twice as large at 2 than at 1 GHz will have substantial consequences. The Multi-Scale Multi-Frequency-Synthesis (MS-MFS) algorithm provides the ability to simultaneously image and fit for the intrinsic source spectrum. The spectrum is approximated using a polynomial in frequency, with the degree of the polynomial as a user-controlled parameter. nterms=2:the number of Taylor terms to be used to model the frequency dependence of the sky emission. Note that the speed of the algorithm will depend on the value used here (more terms will be slower); of course, the image fidelity will improve with a larger number of terms (assuming the sources are sufficiently bright to be modeled more completely). This will take a little while (likely around 30 minutes), so it would probably be a good time to have coffee or chat about EVLA data reduction with your neighbor at this point. Once clean has completed, inspect the brighter point sources in the field. You will notice that some of the artifacts which had been symmetric around the sources themselves are now gone; however, since we did not use W-projection this time, there are still strong features related to the non-coplanar baseline effects still apparent. Finally, we will combine the W-projection and MS-MFS algorithms to simultaneously account for both of the effects. Be forewarned -- these imaging runs will take a while, and it's best to start them running and the move on to other things. In testing, both of these runs (on the auto- and by-hand-flagged data) took around an hour. Again, looking at the same outlier source, we can see that the major sources of error have been removed, although there are still some residual artifacts. One possible source of error is the time-dependent variation of the primary beam; another is the fact that we have only used nterms=2, which may not be sufficient to model the spectra of some of the point sources. Comparing the images using the two different data sets, we can see that there is still a substantial improvement in image fidelity using the by-hand-flagged data. This isn't too surprising, since our plotms displays showed that there was still some RFI present, and it's also possible that the auto-flagging overflagged some portions of the data, also leading to a reduction in the achievable image rms. This page was last modified on 9 April 2012, at 12:37.